There is a huge possibility that you will start seeing advertisements entitled “Ads By Slicksignet” after the installation of SlickSignet on your computer. The program claims to be able to help you customize, personalize, and optimize your outgoing messages; however, there is a possibility that it will perform other activities as well. As has been already mentioned, the program might show commercial ads. In addition, it might collect information associated with your behavior on the web. The only way to get rid of Ads By Slicksignet and stop other suspicious activities is to delete SlickSignet from your computer. If you do not know how to do that, you should read through this article. Our security experts believe that SlickSignet is an advertising-supported application that is going to show ads labeled as Ads By Slicksignet. If you already see them, you should not click on them because they might take you to untrustworthy websites. It is better not to keep suspicious programs on your system because they might also perform different activities behind your back. 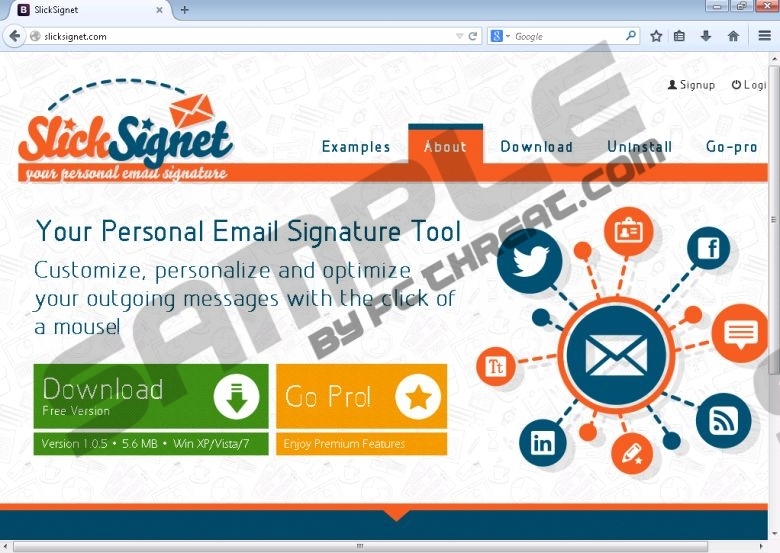 In case of SlickSignet, there is a possibility that it will not only generate Ads By Slicksignet, but will also connect to the Internet without your permission and collect non-personally identifiable information. You might still see advertisements after the removal of SlickSignet because other advertising-supported applications might be present. You might not even know that you have them because the majority of undesirable applications enter the system without a user’s consent. You should be especially cautious if you surf the Internet on a daily basis. The easiest way to prevent malware from slithering onto your computer is to install an antimalware tool. Make sure that the software which you install on your system is trustworthy if you do not want to encounter malicious software ever again. If you want to get rid of Ads By Slicksignet, you have to remove SlickSignet from your system. There is a possibility that you will be able to do that via Control Panel; however, if you feel that you cannot do it manually, you should scan your system with an automatic malware remover, such as SpyHunter. An automatic tool will detect and remove all the existing infections from your PC. It will also protect your system from other serious computer infections that might enter your system in the future. Select the unreliable program and then click Remove. Find the software which you are going to remove. Select it. Quick & tested solution for Ads By Slicksignet removal.